The trapezius muscle is troubling so many people you just cannot imagine. If your trapezius contains trigger points, you can experience headaches as well as arm or upper back pain, depending on the localisation of these points. It can contribute to the following pain symptoms. Click on the corresponding link to learn how to achieve relief. 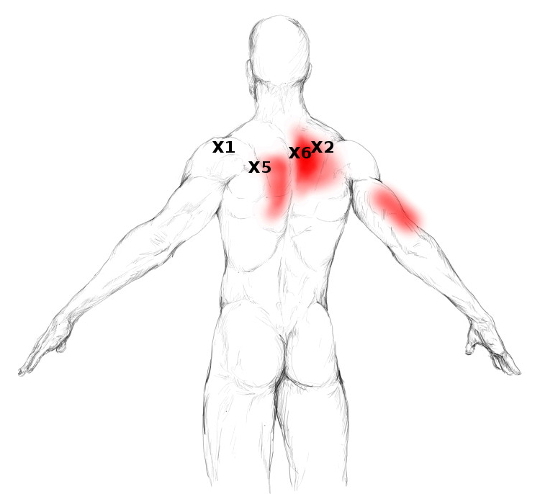 For an even better localisation of trigger points in this muscle, just compare the trigger point number – displayed as “X” – in the pain zone pictures with the one in the picture shown under attachment points. This way you will have no problems at all to locate them – if present -. 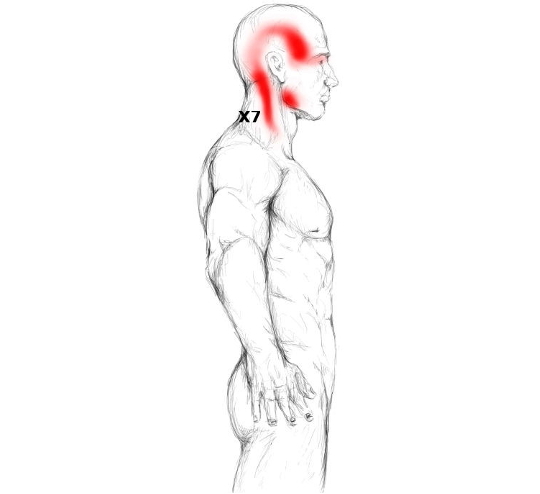 Any movements or activities that are mentioned in the “Function chapter” and under “Trigger point activation” may be painful or impaired when your trapezius contains trigger or tender points. Furthermore, with too much tension in this muscle you may experience a stiff neck. You remember that the upper part of this muscle helps to rotate your head to the other side, right? So if this one is too tight, it hinders this movement and thus may contribute to your stiff neck. The trapezius muscle consists of three parts – upper, middle and lower part –. This muscle covers quite a big surface on your upper back. 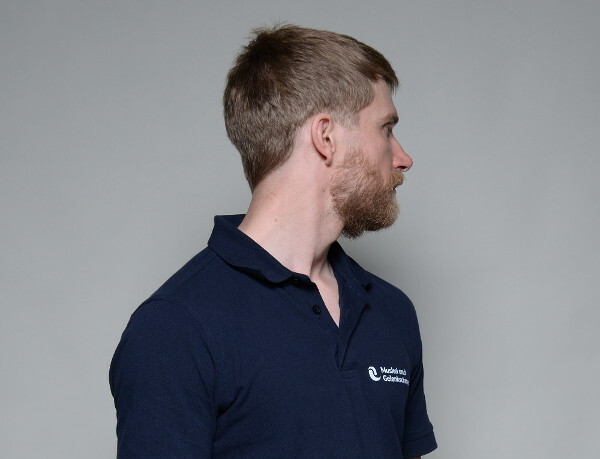 The upper part runs from your cervical spine down to your collarbone while the middle part originates from the first four of your thoracic vertebras and attaches at your acromion – the bony landmark the top and very outside of your shoulder. The lower part runs from the rest of your thoracic spine to your spine of scapula. That is the bony and horizontal line that you can feel on your shoulder blade. When all the parts of the trapezius muscle contract, they help to extend your neck and upper back – not shown below -. The upper part of your trapezius pulls your shoulder blade upwards and outwards and thus helps to elevate/raise your arm. Additionally it bends your head towards the same side – lateral flexion – and rotates it to the other side. The middle part draws your shoulder blade towards your spine whereas the lower part pulls it downwards and towards your spine – not shown -. 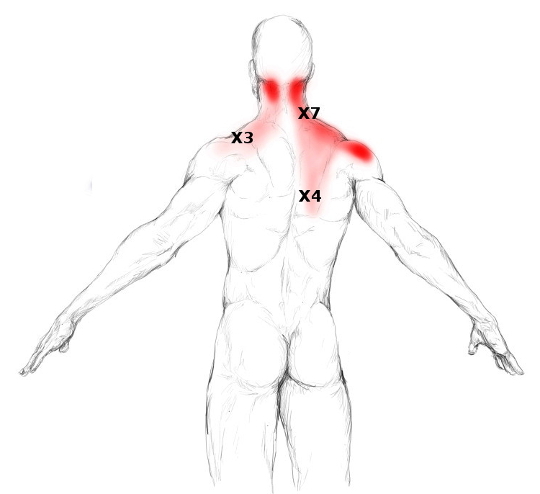 Acute and strong traumas like a car accident can create tender and trigger points in the whole trapezius muscle. When you hit an object with your car, you get hurled into your seat belt till it stops the motion. This way your head gets bend over hard and fast. Your trapezius gets stretched so fast and forcefully during that movement – as this is the opposite movement that the muscle as a whole performs – that trigger points can be created. The upper and middle part of your trapezius muscle is probably the trouble zone number one. It is the one that gives problems to a lot of people. Among others this part of can get overworked by the mechanical stress of the straps of a heavy back pack pushing into the muscle. A similar effect can occur to women with large breasts that wear bras with narrow straps. Again those straps are pulling on the muscle, thus place mechanical stress on it and may overload it over time. Also watching TV with your head constantly turned, puts lots of stress on the upper trapezius as it stays in a shortened position for a prolonged period of time. The reason for this is that one of its functions is to turn your head. The middle part of this muscle is mostly overworked when you do any kind of work with your arms elevated in front of you. This is because your shoulder blade has to move outwards a little if you raise your arm in front of you. Thus, the muscle gets stretched on the one hand but on the other hand still has to perform stabilizing work. Doing this over a longer period of time can lead to tender and trigger points. The lower part of the muscle usually gets overworked when you work in a bend over position for long times, as it may happen in gardening or cutting hair. You will not have a hard time to feel this muscle as it is so big and superficial. The upper part can be sensed with your fingers. Just grab some skin and underlying muscle tissue at the side of your neck and you will have the upper part in your hands. The upper part is pretty small and narrow. Do not expect a big muscle. In circumference it is not bigger than a pen. At times it can be difficult to feel the upper part of this muscle, because often it is very tense and then snuggles even more to your cervical spine. 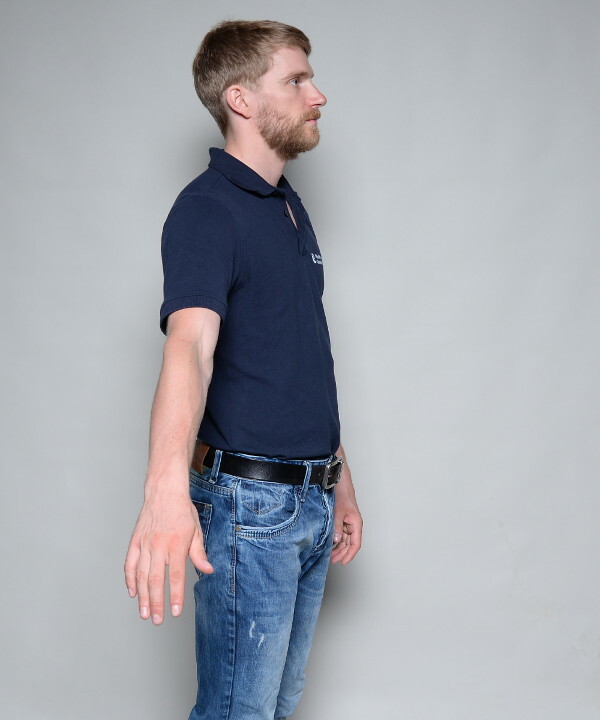 It makes sense to start the palpation a bit lower as the muscle gets bigger in circumference the lower you get. Place your hand next to your cervical spine. Now try to pinch the muscle in the "back portion" of your neck. There is only one muscle that you can slightly pull away. Feeling the middle part might be the easiest for you as it is so big and bulky. 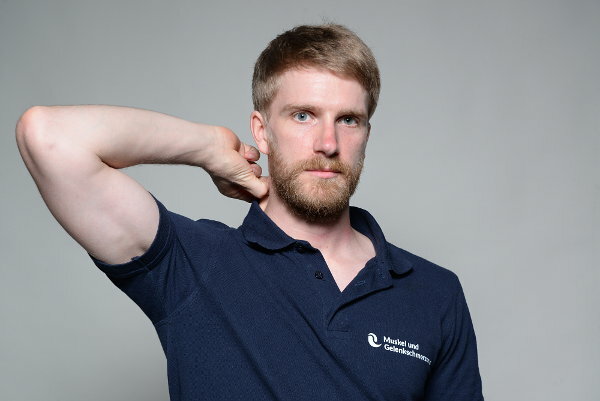 Just put your fingers on top of your shoulder and pinch the big roll of muscle. Now you have the middle part of your trapezius between your fingers. To feel the lower part, just reach at your back as if you were about to scratch the area between your shoulder blades. If you now move your shoulders a little towards your spine you can feel the lower trapezius bulking up. Depending on what part of the trapezius muscle you want to massage I recommend using your hands, the Trigger Fairy or a massage ball. For navigation you can use the muscle picture shown above. Let us start with the upper part. Pinch the muscle as you did already when feeling it. Now search for tender spots. As soon as you hit one, slowly roll it a couple of times between your fingers. But stop before your hands are getting tired. Using the Trigger Fairy for massage allows you to work the muscle in a very intensive way, without straining your hands. This is a huge advatage. 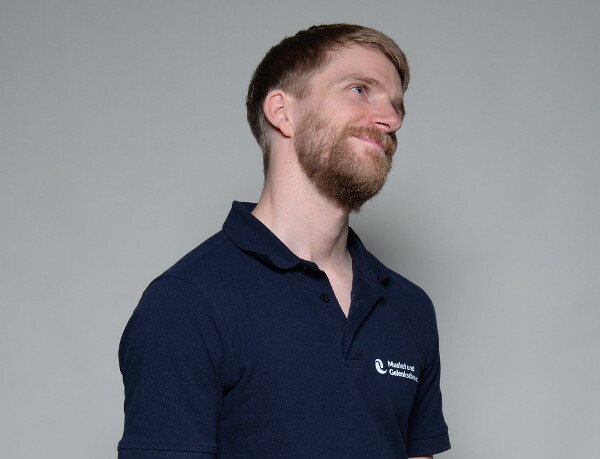 You can use prescise massage strokes as well as the pressure-motion technique. Place the Fairy on the lower part of your neck, right on top of the muscle. Execute pressure and slowly move down the muscle, all the way to the outside of your shoulder. Vary the direction of the pressure and the position of the Trigger Fairy, respectively. Try to massage with pressure from the front, from above and from behind. ... and I initiate the the massage stroke with my thumb. My thumb lies at the side of the Fairy´s bow. This thechnique is especially suitable in the “front of your lower neck”. Pressurize the muscle from the front. Then move your shoulder and search this way for tender spots in the muscle. Lift or depress your shoulder or use circular motions. … but never maximize the pain. 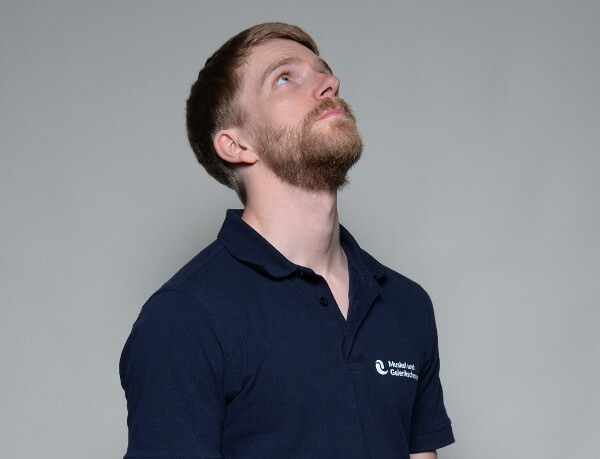 Make sure to inspect the whole area of the “front part of your lower neck”, which ranges from right next to your cervical spine all the way out where your trapezius meets your collarbone. Massaging the rest of your trapezius muscle – middle and lower part – is done best with a massage ball. Place it on the area you want to massage. Push yourself against a wall and then slowly search for tender spots. As soon as you encounter one, stay there and slowly roll the ball over it a couple of times. In order to massage the whole trapezius muscle you might have to readjust the ball and your position on the wall a couple of times.